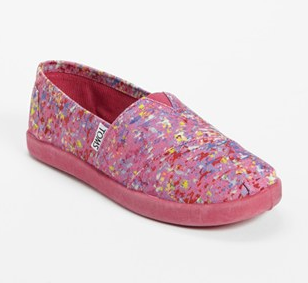 In addition to the Zulily TOMS Shoe Sale running right now, there’s also a Nordstrom TOMS Shoe Sale running right now. I see the Women’s Crochet Classics for $39.49, Classic Canvas Slip-Ons for $32.12, and Kids TOMS starting at $19.97! It doesn’t look like there is quite as big of a selection as there is over at Zulily, but Nordstrom offers FREE shipping and returns. So if you can find a similar price for your style over at Nordstrom, this might be the better deal for you! Thanks for the heads up, Charlotte! just fyi – i found the crochet toms to run a bit smaller than the regular canvas ones. i returned mine and went back to canvas. but they are so cute!!!! Good to know – thanks, Lainie!